Nashville, TN – The Tennessee Department of Agriculture says fairs across Tennessee are celebrating the awards they have earned for showcasing agriculture in communities large and small. Tennessee Department of Agriculture honors Fairs across Tennessee at 97th Annual Convention of the Tennessee Association of Fairs. 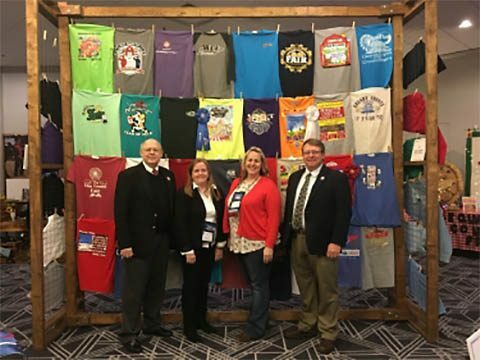 Approximately 850 people attended the Fairs Merit Awards recognition dinner program during the 97th Annual Convention of the Tennessee Association of Fairs (TAF) held Jan. 17-21, 2019, in Nashville. The top award went to the Warren County Fair, which was named the Champion of Champions Fair for 2018. The Champion of Champions is selected form the 2017 Division Winners. The Warren County Fair was also among the 53 fairs recognized with the Award of Merit based on agriculture, educational value, overall operations, and the promotion of local interest and community spirit. Phil Booher, manager of the Appalachian Fair in Gray, Tennessee, will serve as 2019 President for TAF. In the regional division, the Appalachian Fair and the Tennessee Valley Fair received the Award of Merit. In the state division, the Tennessee State Fair received the Award of Merit based on overall fair operations. Other 2018 honorees include Judy Woodard of the Trousdale County Fair, who received the Judy Basse Memorial Award for outstanding fair secretary, and Clara Terry of the Scott County Fair, who received the Thornton Taylor Award for outstanding dedication to the fair programs in Tennessee. The statewide Fair Showcase offered prize money and awards in 36 categories including best fair catalog, website and educational displays, promotional videos, posters, scrapbooks, creative ideas, and free-standing and table-top exhibits. In its 21st year, the competition drew 504 entries from 38 fairs. In 2018, almost three million visitors attended county, regional, and state fairs in Tennessee, which generated $12 million in gross receipts. More than 19,000 volunteers devoted valuable time and resources to the events featuring more than 200,000 agricultural exhibits. Some 26,000 exhibitors showcased livestock, farm crops, and other agricultural assets.